The Infecon® specimen transport bag is the perfect choice for the secure transport and handling of diagnostic specimens. 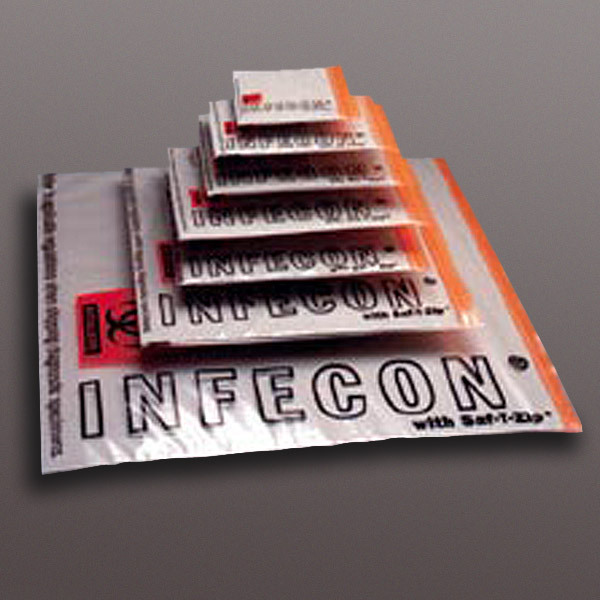 Infecon bags are specially manufactured using a patented process which guarantees the elimination of leaks. The handy document pouch prevents misplacing vital paperwork. Produced from durable 2.8 mil polyethylene, the Infecon bag remains flexible when frozen. Preprinted with the OSHA required biohazard symbol, the bag also comes with a strong, easy-to-close, double-track Saf-T-Zip closure. The larger sizes meet the need for transporting oversized diagnostic specimens. All instruments and names of manufacturers mentioned herein are the trademarks of their respective companies and are used for reference purposes only. Globe Scientific Inc. expressly disclaims any affiliation to them.